RELIEFWEB.INT – Air strikes in support of forces loyal to exiled President Abedrabbo Mansour Hadi went on, despite a six-day humanitarian truce, which technically took effect just before midnight on 10 July. Saudi-led warplanes bombed Yemeni rebels who clashed with pro-government fighters in the south despite a UN-declared truce aimed at delivering desperately needed aid, military sources said. And 10 civilians were killed in pre-dawn raids on the capital Sanaa, according to medical sources. 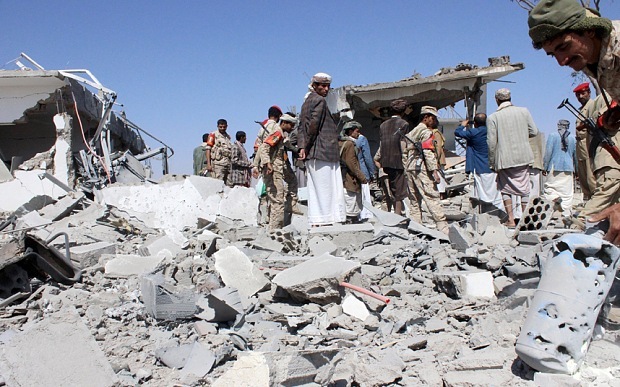 The coalition air raids targeted positions of the Iran-backed Shiite rebels and their allies, forces loyal to former president Ali Abdullah Saleh, in Aden and Lahj provinces. Air strikes in support of forces loyal to exiled President Abedrabbo Mansour Hadi went on despite a six-day humanitarian truce which technically took effect just before midnight Friday. The coalition brushed aside the ceasefire, saying it did not receive a request from Hadi’s government to halt attacks, while the leader of the Huthi rebels said he did not expect the truce to take hold. Air strikes targeted a building of military engineering in the Sanaa neighbourhood of Saawan, witnesses said. Medical sources said the raids killed 10 civilians. Raids also hit rebel positions on the outskirts of the port city of Aden as well as a convoy in the city’s neighbourhood of Khor Maksar, a military source said. Clashes intensified Sunday in Aden, where rebels have laid siege to many areas that are controlled by southern fighters loyal to Hadi and known as the Popular Resistance. The southern fighters managed to push back the rebels in the coastal Ras Amran area, west of Aden, according to General Fadhel Hasan, a spokesman for the Popular Resistance. The fighting left 17 gunmen dead, including 11 rebels, according to Hasan, who said the southern fighters have “received sophisticated weapons from the coalition”. Three air raids struck Al-Anad air base which is controlled by rebel forces in Lahj, north of Aden, another military source said. Meanwhile, six rebels were killed in a roadside bomb in Lahj, an official said. The United Nations has declared Yemen a level-3 humanitarian emergency, the highest on its scale, with nearly half the country facing a food crisis. More than 21.1 million people — over 80 percent of Yemen’s population — need aid, with 13 million facing food shortages, while access to water has become difficult for 9.4 million people. The UN says the conflict has killed more than 3,200 people, about half of them civilians, since late March. After the rebels overran Sanaa unopposed in September, they went on to seize control of several regions, and advanced on Aden where Hadi had taken refuge after escaping house arrest.